Cincinnati's oldest restaurant offering the city's BEST OUTDOOR DINING, 150 years of character, and authentic German and contemporary American cuisine. One of the historic treasures of Cincinnati, Mecklenburg Restaurant and Bier Garten was established in 1865. Priding ourselves on our German heritage, Mecklenburg Gardens stays true to its roots providing delectable German cuisine along with traditional German lagers, dunkels, hefeweizen, and pilsners on tap. 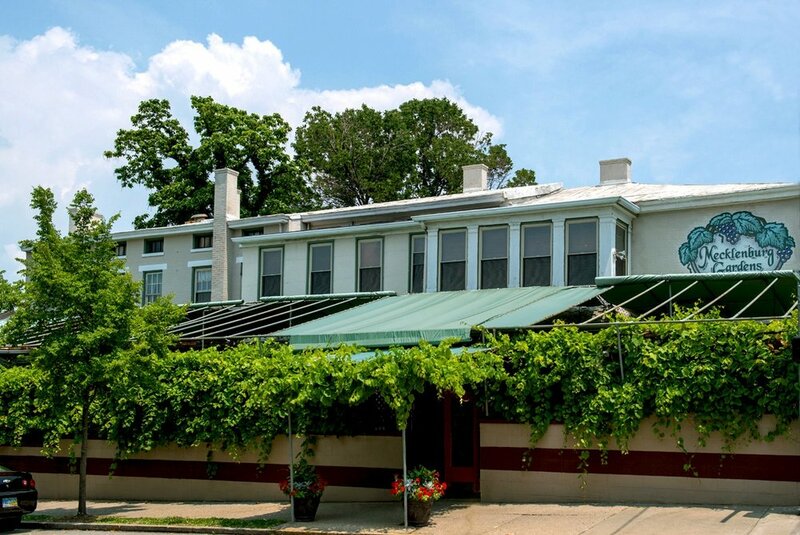 Come on in, enjoy a round in our Black Forest bar or sit under the grape vines in the garden, and then stay for a plate of our chef's delicious fare! Since 1865, Mecklenburg Gardens has remained an important piece of the cultural, social and gastronomical history of Cincinnati. A symbol of the Queen City's rich German heritage, in the late 1800's and early 1900's, the restaurant served as a meeting place for many of Cincinnati's German residents to learn about the American way of life. Staying true to tradition, to this day we host meetings of German Heritage groups, prepare traditional German dishes complemented by superb American classics, and serve the finest steins of German Lager in the city! Featured in many prominent media outlets, Mecklenburg Gardens has been named among the top outdoor dining restaurants in Cincinnati, and even listed among the best bier gardens in the nation! Whether you're a permanent resident of Zinzinnati or just stopping through, come on in and revel in the historical prevalence of the building and enjoy a cold one in the best bier garden in town! Mecklenburg's famous Terminator debuts on Food Network's "Ginormous Foods"
"People pour into this bustling beer garden for the German brews and bites. Popular picks include the sauerkraut balls and schnitzel, but Josh Denny couldn’t resist the sandwiches. He started with a beer-battered cod sandwich, then tackled a sauerbraten sandwich stuffed with thick slices of wine-marinated beef roast. The most over-the-top creation of them all, though, proved to be The Uber Terminator, which stars a 38-inch grilled Mettwurst sausage laced with paprika, garlic and cayenne pepper." "Top 5 Outdoor Dining Spots!" "Mecklenburg Gardens: A Cincinnati Tradition"
"21 Best Beer Gardens in the Nation!"